In a world where most games tend to immerse you into massive game worlds and lots ofdangerous missions, Air Shark 2 is a game that can be seen as a breath of fresh air. The title is a small arcade game in which you control a hunting plane that needs to be guided into a variety of missions and environments. The gameplay really is one of the best you can find right now. Air Shark 2 successfully manages to add up a variety of unique and interesting units that you need to kill, from tanks to carriers, planes or submarines, all of which have a single purpose, and that is to kill you. Air Shark 2 does however provide you with a great arsenal that you can use at all times while playing. Right from the start you will see that the game includes multiple types of rockets that you can use, alongside the normal flares and a variety of unique tools as well. The best thing here though is that all the primary weapons (non-rockets) are upgradeable, something that adds a lot of incentives and uniqueness to the game. The game comes with 18 different levels, which are more than enough to prove your might at all times, but what impressed us the most are the bosses. Only 3 bosses can be found in Air Shark 2, but battling them in an adrenalin filled experience, as each one of them comes with a variety of attacks and moves that are different and unpredictable. Graphically, Air Shark 2 looks amazing because it's powered by a 3D engine that just makes the whole experience a stunning one. The vehicles are very detailed, your plane is depicted at a very high quality and overall the game just boosts a beautiful set of visuals for you to enjoy. The missions are diverse and all of them are quite risky, especially since the enemies get tougher and tougher. You have multiple difficulty levels that can be adjusted after each mission, so even if a mission seems too hard, you can try it again on an easier setting. Included with Air Shark 2 you can find a very interesting 2-player mode that boosts a lot of life into the experience. Playing with a friend is the heart and soul of the game, and you can have a ton of fun as you enrich this unique experience and take it to a whole new level. You get tons of new power-ups in Air Shark 2, and one of the most valuable ones is the health pack, which can be foundall the time in distinct places after you kill enemies. It's important to know that the power-ups in Air Shark 2 tend to disappear quickly, and this is why you need to be very fast and precise if you want to get astounding results. All in all, Air Shark 2 is a fun little arcade game. It's a fast download, but despite the small size, it's an intense and exciting arcade shooting experience that you can rarely find online. It runs smooth, and it just manages to bring you a large amount of fun, especially if you play it with a friend. this game is very popular. many parties created such similar game. Alone in an abandoned old city, start your adventure to fight against blood-thirsty zombies. 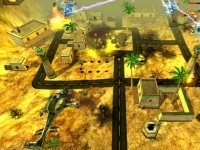 Tank combat game that contains explosive gameplay and various weapons.